After my arrival in Niigata, I was invited to visit the nearby Hakkaisan Son Jinja Shrine to join in a festival. The god of Hakkaisan Mountain is enshrined there and worshiped by locals. It sounded like a wonderful way to spend a fall afternoon. 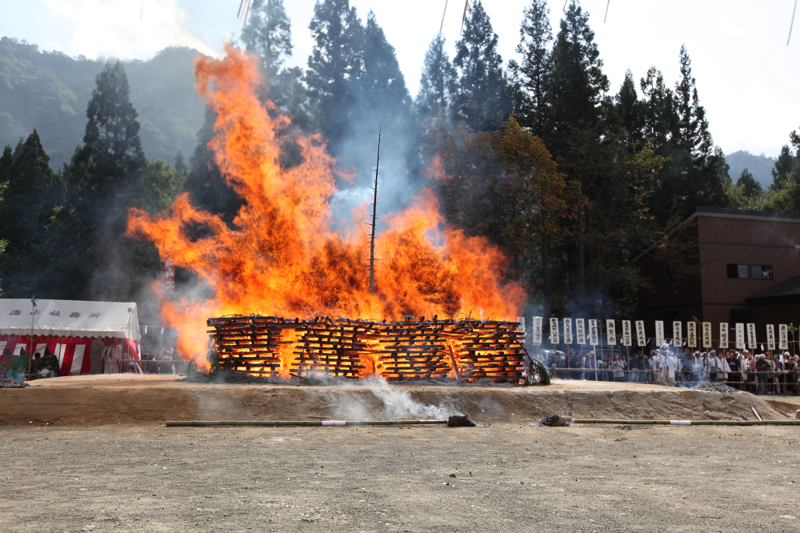 However, I started to worry a bit when I learned the festival was called “Hiwatari taisai “ or “walking on fire” festival. 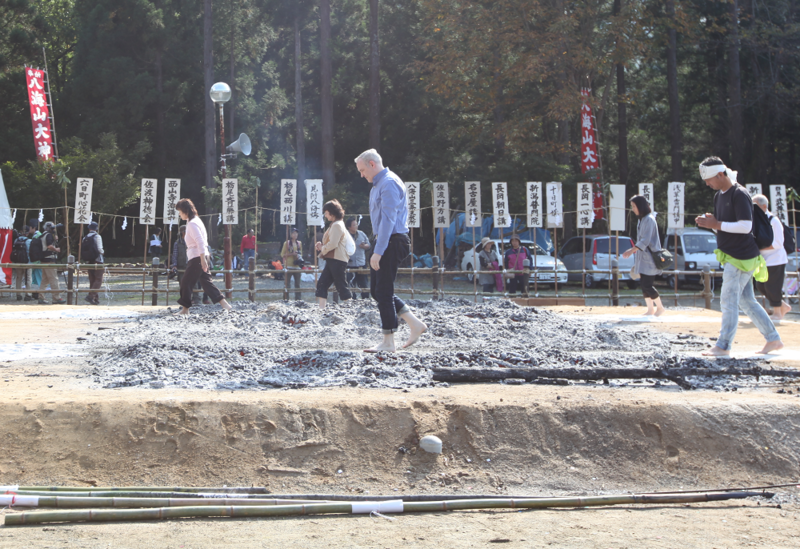 After a bit of research, learned the festival has been going on yearly for over 200 years and that walking on the hot coals is an act to pray for wellbeing, protection and health in the coming year. I decided firmly that I would enjoy watching the action but would not be walking on hot coals myself. There was a large crowd gathered at the festival when I arrived. 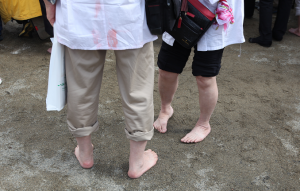 I saw many festival goers walking around barefoot in preparation for the big event. 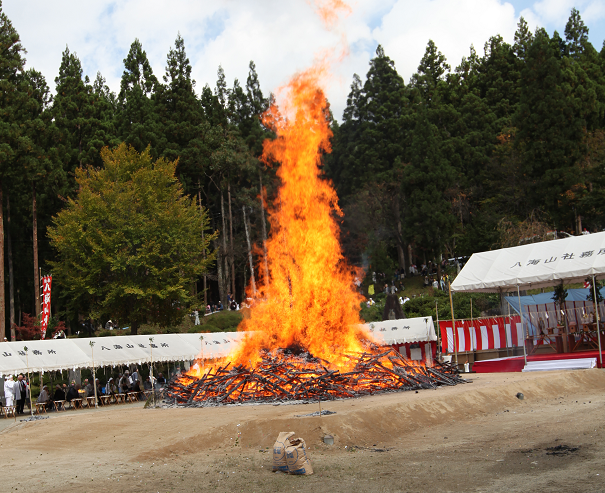 After a beautiful procession of shinto priests, dignitaries and even an ogre (oni), the fire was lit. The flames were soon so high and the heat so intense that the crowd had to move back from the fence. When I saw the huge fire and billowing smoke, I began to question the sanity of the people lining up to walk on the coals, and I took a moment to re-confirm with myself that I would not be walking. When the fire died down, two paths were raked through the coals and sprinkled with salt to temper the heat. Then it began – people, lots of people, started walking in two lines though what remained of the fire. Senior citizens, children and everyone in between was walking across a path through the hot embers. After a few minutes, a colleague simply took me by the arm and led me to a place in a long line of people. Before I could protest, my shoes were off and I knew there was no going back. Soon I found myself face to face with the glowing embers. 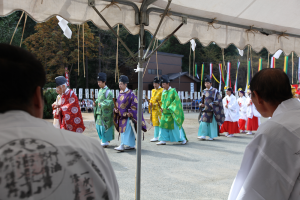 As we approached, each participant received a purification blessing above their head from an officiant waving an onusa (a paper streamer wand used in shinto ceremonies). Before I knew it, I was across and other than my toasty soles getting covered in ash, I was no worse for wear. Even though I firmly decided just to observe, sometimes circumstances conspire to get you involved, and hopefully a year of wellbeing and health will be my reward! This entry was posted in Tim's Corner on December 2, 2016 by hakkaiedit.